"I See Myself As An Author"
The finial on the top is a cast glass stack of books with a typewriter. 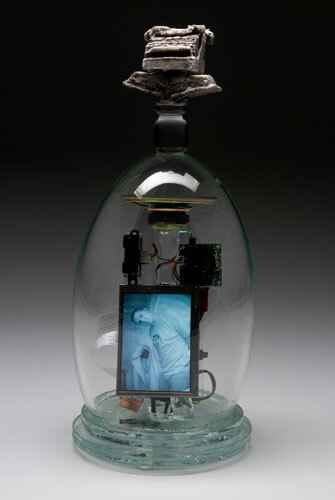 Instead of a video, this piece features a camera, which shows the viewer on the screen. On the front of the wall mounting is a red button, and when pushed, plays the sound of an old typewriter typing. A 1939 Underwood, to be exact. The sound is of the words, “To Kill A Mockingbird” being typed over and over.